Abstract Interferometric synthetic aperture radar (InSAR) images reveal a pre-eruption deformation signal at Kizimen volcano, Kamchatka, Russia, where an ongoing eruption began in mid-November, 2010. The previous eruption of this basaltic andesite-to-dacite stratovolcano occurred in 1927–1928. InSAR images from both ascending and descending orbital passes of Envisat and ALOS PALSAR satellites show as much as 6 cm of line-of-sight shortening from September 2008 to September 2010 in a broad area centered at Kizimen. About 20 cm of opening of a nearly vertical dike provides an adequate fit to the surface deformation pattern. The model dike is approximately 14 km long, 10 km high, centered 13 km beneath Kizimen, and strikes NE–SW. Time-series analysis of multi-temporal interferograms indicates that (1) intrusion started sometime between late 2008 and July 2009, (2) continued at a nearly constant rate, and (3) resulted in a volume expansion of 3.2 × 107 m3 by September 2010, i.e., about two months before the onset of the 2010 eruption. Earthquakes located above the tip of the dike accompanied the intrusion. Eventually, magma pressure in the dike exceeded the confining strength of the host rock, triggering the 2010 eruption. Our results provide insight into the intrusion process that preceded an explosive eruption at a Pacific Rim stratovolcano following nearly a century of quiescence, and therefore have implications for monitoring and hazards assessment at similar volcanoes elsewhere. We determine a 3-D P-wave velocity structure of the mantle down to 700 km depth under the Kamchatka peninsula using 678 P-wave arrival times collected from digital seismograms of 75 teleseismic events recorded by 15 portable seismic stations and 1 permanent station in Kamchatka. The subducting Pacific slab is imaged clearly that is visible in the upper mantle and extends below the 660-km discontinuity under southern Kamchatka, while it shortens toward the north and terminates near the Aleutian–Kamchatka junction. Low-velocity anomalies are visible beneath northern Kamchatka and under the junction, which are interpreted as asthenospheric flow. A gap model without remnant slab fragment is proposed to interpret the main feature of high-V anomalies. Combining our tomographic results with other geological and geophysical evidences, we consider that the slab loss may be induced by the friction with surrounding asthenosphere as the Pacific plate rotated clockwise at about 30 Ma ago, and then it was enlarged by the slab-edge pinch-off by the asthenospheric flow and the presence of Meiji seamounts. As a result, the slab loss and the subducted Meiji seamounts have jointly caused the Pacific plate to subduct under Kamchatka with a lower dip angle near the junction, which made the Sheveluch and Klyuchevskoy volcanoes shift westward. 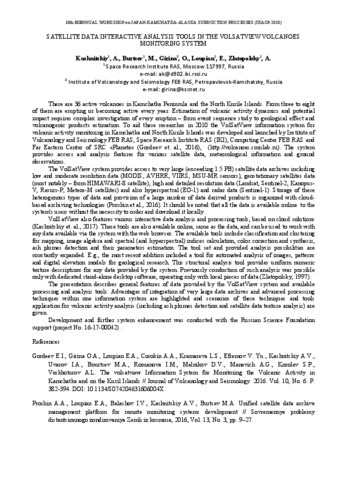 Pb isotope data are used to constrain the chemical contribution of the subducted components in the recycling beneath Klyuchevskoy volcano, the most active volcano in the Kamchatkan arc. The Pb isotope ratios of Klyuchevskoy basalts (206Pb/204Pb= 18.26–18.30, 207/Pb204Pb= 15.45–15.48, 208/Pb204Pb= 37.83–37.91) define a narrow range that falls within the Pacific mid-ocean ridge basalt (MORB) field and are among the least radiogenic island arc basalts measured to date. These data are similar to data from three other Quaternary Kamchatkan volcanoes: Tolbachik, Kumroch-Shish, and Maly Semiachik. In contrast, North Pacific sediments (primarily siliceous oozes) collected parallel to the Kamchatkan trench during Ocean Drilling Program Leg 145, have Pb isotope ratios (206Pb/204Pb= 18.51–18.78, 207Pb/204Pb= 15.56–15.64, 208Pb/204Pb= 38.49–38.75) that are more radiogenic than either the Klyuchevskoy basalts or Pacific MORB. 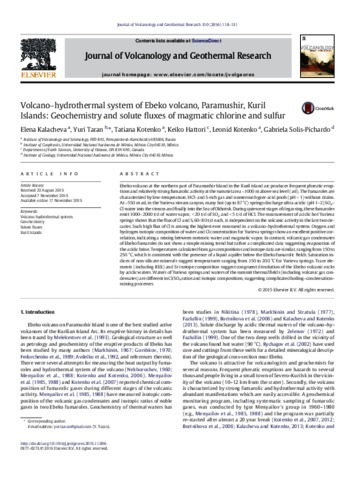 Incorporation of even a small amount of sediment in the source of the Klyuchevskoy magmas would shift the Pb isotope ratios of the erupted basalts from the MORB field to more radiogenic values. 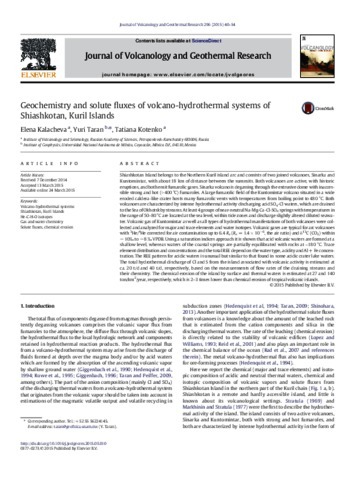 The absence of 10Be and elevated Pb isotope ratios in the Kamchatkan volcanic lavas, despite the presence of distinctively radiogenic Pb in the North Pacific sediments makes it unlikely that sediments or sediment-derived fluids are involved in the source magmas beneath Kamchatka. The Kamchatkan arc thus represents an “end-member” whereby little or no sediment is involved in terms of elemental recycling and arc magma genesis. 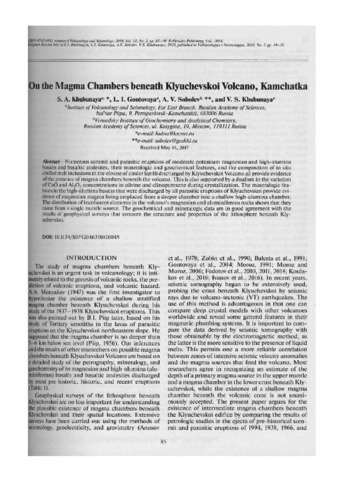 The major and trace elements, Pb, Sr and Nd isotope data of the Kamchatkan basalts are most consistently explained if derived from a fluid-fluxed, peridotitic mantle wedge source, wherein the fluid composition is dominantly controlled by dehydration of altered oceanic crust, imparting a radiogenic 87Sr/86Sr, and MORB-like Pb isotope signature to the mantle source. The erupted Klyuchevskoy lavas preserve a slab signature derived from incompatible elements that are strongly partitioned into the fluid. The 30 km of arc crust through which the Klyuchevskoy magmas traverse prior to eruption is not composed of older crust, but must be juvenile, similar in isotopic composition to MORB. Khrenov A.P., Ozerov A.Yu., Litasov N.E., Slezin Yu.B., Murav’ev Ya.D., Zharinov N.A. 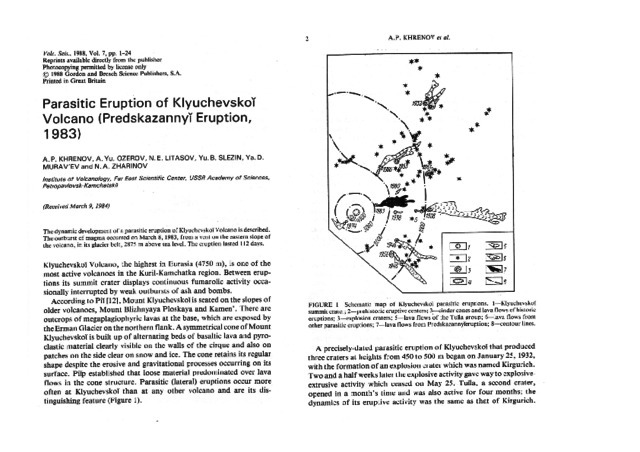 Parasitic eruption of Klyuchevskoy volcano (Predskazanny eruption, 1983) // Volcanology and Seismology. 1988. V. 7. P. 1-24. 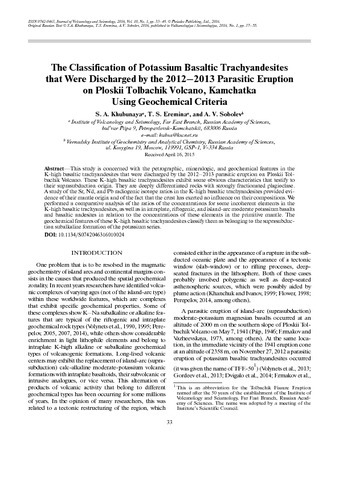 Abstract—This study is concerned with the petrographic, mineralogic, and geochemical features in the K-high basaltic trachyandesites that were discharged by the 2012–2013 parasitic eruption on Ploskii Tolbachik Volcano. These K-high basaltic trachyandesites exhibit some obvious characteristics that testify to their suprasubduction origin. They are deeply differentiated rocks with strongly fractionated plagioclase.A study of the Sr, Nd, and Pb radiogenic isotope ratios in the K-high basaltic trachyandesites provided evidence of their mantle origin and of the fact that the crust has exerted no influence on their compositions. We performed a comparative analysis of the ratios of the concentrations for some incoherent elements in the K-high basaltic trachyandesites, as well as in intraplate, riftogenic, and island-arc moderate potassium basalts and basaltic andesites in relation to the concentrations of these elements in the primitive mantle. The geochemical features of these K-high basaltic trachyandesites classify them as belonging to the suprasubduction subalkaline formation of the potassium series. Изучены петрографические, минералогические и геохимические особенности К-трахиандезибазальтов побочного извержения 2012–2013 гг. вулкана Плоский Толбачик. К-трахиандезибазальты имеют явные признаки надсубдукционного происхождения. Это глубоко дифференцированные породы, характеризующиеся значительным фракционированием плагиоклаза. Изучение радиогенных изотопных отношений Sr, Nd и Pb в К-трахиандезибазальтах свидетельствует об их мантийном происхождении и отсутствии влияния земной коры на их составы. Проведен сравнительный анализ отношений содержаний некогерентых элементов в К-трахиандезибазальтов,внутриплитных,рифтогенных и островодужных умереннокалиевых базальтах и андезибазальтах к содержанию этих элементов в примитивной мантии. Геохимические особенности К-трахиандезибазальтов позволяют отнести их к надсубдукционной субщелочной формации калиевого ряда.